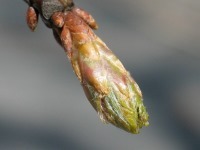 Spring 2010 was anomalously early in much of the eastern United States, and resulted in lilacs and other species leafing and flowering weeks ahead of schedule. When 2012 began showing signs of another early spring, we launched a campaign across the northeastern quadrant of the United States to capture observations of plant phenology. Our question was, "Will spring 2012 arrive as early as spring 2010? "We invited registered Nature’s Notebook participants in a region encompassing St. Louis, Missouri to the northeastern tip of Maine to carefully track the phenology of nine species of deciduous overstory trees from March 30-May 18, 2012; more information on the specifics and outcomes of this campaign. 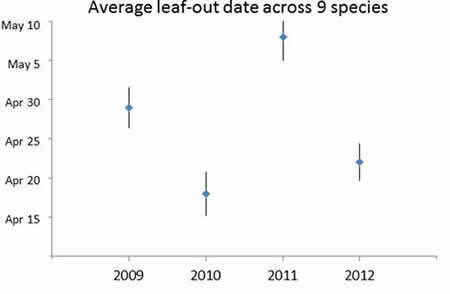 When we pooled observations for all species together across the study region, we found that the first leaf dates reported in 2012 were, on average, just as early as in 2010. These dates were, on average, a week earlier than in 2009, and nearly 3 weeks earlier than in 2011. Final results: spring 2012 was as early as spring 2010! Spring in two of the four years we have been collecting data on these species has arrived anomalously early, suggesting that very early springs might be occurring more frequently. Will this pattern continue into the future? Only time will tell… well, that and lots of observations of plant phenology!